Especially manufactured as FREE give away for the second Enfant Terrible and Gifgrond collaboration on 27 February 2010. This cassette tape features two tracks of each live act for the night. All six tracks are previously unreleased. 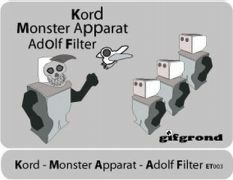 Adolf Filter serves you the dark side of synth pop while Kord plays some spacey and laidback elektro pop. Monster Apparat is the collaboration of musicians from Adolf Filter and Kord and brings you very catchy and dancefloor friendly elektro and robot pop .